BROOKLYN, NY (FFD PR) — Final Frontier Design (FFD) is pleased to announce that NASA has selected their company for contract negotiations for 2 separate Phase I Small Business Innovative [sic] Research (SBIR) awards, for total potential contracts of $250,000 in 2013. FFD is a small business based in Brooklyn, NY, developing space safety garments for the commercial space industry. The 2013 NASA SBIR awards include development of their single layer, high performance pressure garment arm assemblies, specifically an ‘asymmetrical’ shoulder joint, and further development of FFD’s innovative flexible radiation protective coating, RadFlexPro. Our proposed multilayered, flexible, graded Z radiation shielding, RadFlexPro, provides radiation protection for astronauts in EVA for NASA’s future space missions. RadFlexPro can be integrated into current space suit TMG designs and act as multifunctional layers, providing additional protection from micrometeoroids. Current RadFlexPro designs have three layers. The outer layer serves as a first barrier to decelerate high speed and high energy particles: the following layer decelerate particles more, and the final layer protects from possible secondary radiation. It is proposed that RadFlexPro will significantly increase radiation protection without compromising bulk and mobility in a space suit. RadFlexPro is a composition of several materials and layers, with different properties selected to protect against various types of radiation. Compared to single-material shielding, such as Demron, the same mass of Graded-Z coating shows increased radiation opacity; as an alternative, a lower mass of graded z shielding can provide the same level of protection as a single material sheild. In a typical graded-Z shield, the high-Z layer effectively scatters protons and electrons. Because the matrix of RadFlexPro is adjustable, the coating can be sprayed on surfaces, rolled or laminated, and/or dipped into solution. A matrix solution can be made with different viscosities and densities to suit several bonding techniques. Coated fabrics can in turn be cut out according to flat patterns and sewed with other pieces into a TMG configuration. FFD has considerable experience and hardware to sew thick, heavy, rubbery materials effectively. NASA currently operates EVA in LEO without any dedicated radiation protection. Future missions for EVAs to environments like the moon, asteroids, and Mars require additional protection against radiation. RadFlexPro could serve as a method to further protect astronauts from harmful radiation for NASA. FFD is interested in working on the next generation pressurized garments for NASA’s use in EVA beyond the ISS. The added radiation protection of an astronaut within a highly functional pressure garment would insure a significant advantage for NASA in future space missions. In addition, RadFlexPro is an adaptable coating strategy, which could be incorporated into vehicles for radiation protection for humans and sensitive computer equipment. Its low mass relative to solid lead or aluminum shielding and flexible application options are an economical and efficient alternative to traditidonal vehicle shielding. FFD has identified several potential Non-NASA commercial customers for RadFlexPro. In 2011-12, we conducted negotiations with Space Adventures and SpaceX to provide pressure garments for their commercial space flight program. We are the current supplier of high altitude, full pressure safety garments for Zero2Infinity. We plan to supply space suits to commercial customers by early 2013. In several flight plans for commercial space access providers like these companies, light weight, flexible radiation protection is a highly desirable feature. Final Frontier Design (FFD) proposes to develop and deliver an advanced pressure garment arm with low torque and high Range of Motion (ROM), and increased durability, using their unique single layer approach to the pressure vessel joint. FFD has developed a flat patterned asymmetric shoulder joint for their current space suit pressure garment, with a natural position in human rest adduction, approximately -10 degrees. In addition, this joint has a focused point of rotation, like the human shoulder. Their design reduces discomfort from gathering of fabric in the armpit, provides a large ROM, favorable torque, and allows for close tracking of natural human anthropometry. In addition, FFD’s elbow joint design show consistently high performance, in terms of ROM, torque, and operating pressure. This proposal also utilizes a unique approach to the pressure garment: the single layer integrated pressure garment joint as opposed to a traditional double layer bladder-restraint pressure garment. FFD’s pressure garments have a host of important advantages over double layer pressure garments, including a lower mass, increased ROM, decreased torque, a thinner wall, the reduction of suit layers, the elimination of indexing, lower cost manufacturing, and flat-patterned ease of scaling and repeatability. This proposal will develop two design iterations of FFD’s single layer pressure garment arm, to include both the elbow flexion-extension joint and the shoulder ad-abduction joint. The arms will be designed and tested for +8PSI operating pressure, to meet current ROM standards of NASA’s pressure garments and test and increase FFD’s technology cycling ability. FFD aims to increase their TRL in this project from 4 to 6 through Phase II of this contract. NASA currently operates EVA in LEO. Future missions beyond LEO demand more robust and functional EVA equipment. A space suit with new arm joints could serve as a method to further increase the astronaut’s productivity, work envelope, and further mission assurance for NASA. FFD is interested in working on the next generation pressurized garment for NASA’s use in EVA beyond the ISS. The added benefits in mobility of astronaut within a highly functional pressure garment would ensure a significant advantage for NASA in future space missions. In addition, the proposed mass reduction in the pressure garment is highly desirable for several reasons, including launch weight and overall suit mass during EVA. FFD’s pressure garment technology is comparatively very inexpensive to manufacture, easier to maintain, and easier to scale than many advanced concept space suit equivalents. Finally, the pressure garment components developed here could have a crossover interest in IVA space suit design, as they are soft, flat, and stowable. FFD has identified several potential Non-NASA commercial customers for their pressure garments, including their advanced arms. In 2011, we participated in negotiations with XCOR, Space Adventures, and Space-X, to provide pressure garments for their respective commercial space flight programs. There are several manned space access companies currently in the market for IVA suits beyond these providers, in the Commercial Crew Program of NASA and privately/suborbitally. In 2012, FFD was contracted to construct IVA safety garments for Zero2Infinity, a high altitude balloon company. We plan supply our first production IVA suits to customers by January 2013, and expect testing and validation in 2013. 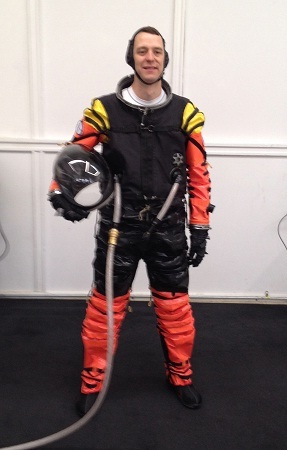 FFD sees a significant market in commercial IVA space suits in the near future. The arm joints developed under this contract have applications for commercial IVA suits. Our designs have unprecedented performance for IVA garments with a high operating pressure, large ROM, low torque, and low mass. Importantly, the garments are relatively inexpensive to produce and can be easily sized because they are flat patterned. Our target market price for an IVA pressure garment is $50,000. This SBIR will provide valuable testing and validation to allow FFD to flight certify their material concepts and designs. We see the testing and proof in flight certification as a significant hurdle to market commercialization for our product, and one that can be greatly assisted by this proposal.